A super yacht in motor yacht clothing. 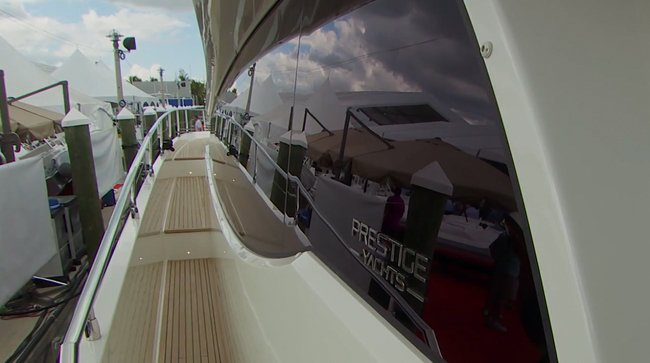 You might think the new Prestige 750 motor yacht would have a predisposition for an identity crisis. 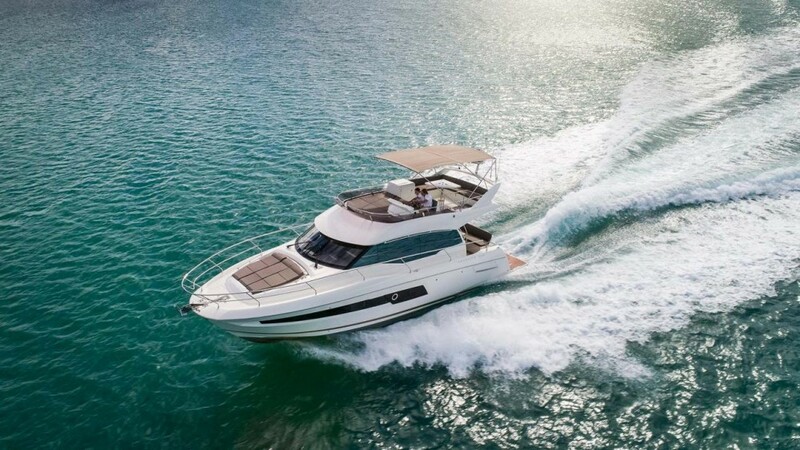 Designed by Italian naval architect Vittorio Garroni and built in Italy for Groupe Beneteau of France, the new yacht actually falls under the Jeanneau product offering. But despite all the names and countries associated with her, the Prestige 750 stands out as an efficient, luxurious yacht that’s pushing into the realm of super yachts at a reasonable price tag of around $4 million. If it could be said that a yacht exudes confidence, then this one definitely would be on that list. The Prestige 750 is the flagship of the Prestige lineup. A distinguishing feature on the Prestige 750 is the master stateroom, which is located on the main deck—something that is rarely seen on yachts under 100 feet. 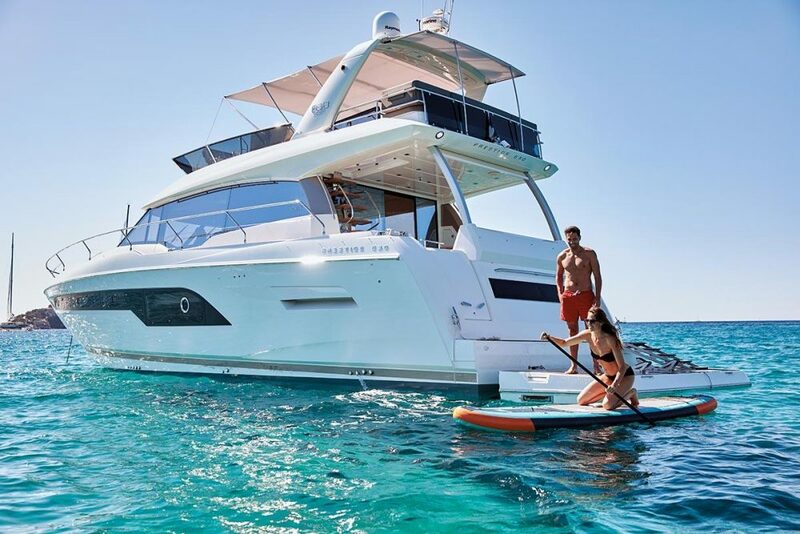 Because there is so much volume in the forward part of the hull, owners enjoy a full-beam master suite that’s only two steps down and ahead of the main living area, and just a short hop from the helm. This placement provides the stateroom with plenty of natural light, both from the side ports and the overhead windows set into the forward deck. A large bed is flanked by a lounge and walk-in closet to port, and a desk and access to the head to starboard. It keeps the owners away from engine noise and guest traffic, and also provides the utmost in privacy. 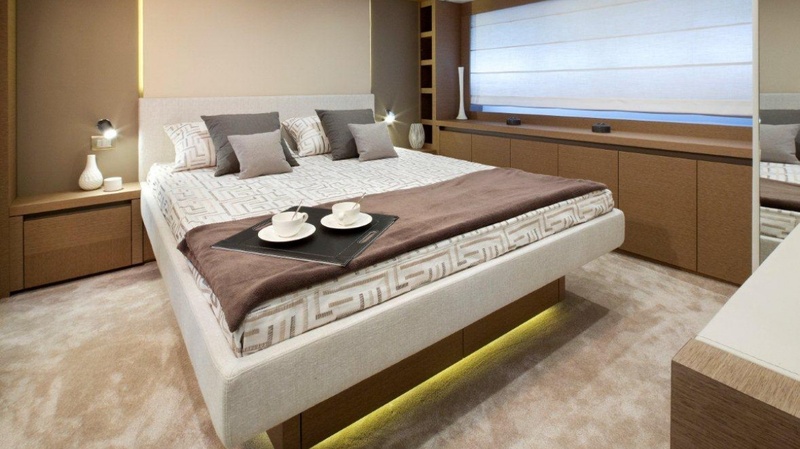 The master stateroom is situated on the main deck of the Prestige 750. Guest comfort is equally important on a vessel of this class. In total, the Prestige 750 has four cabins and three heads, plus full crew quarters that are accessible from the aft swim platform. The full-beam VIP stateroom is located toward the middle of this yacht. On most other boats in this class, it would definitely serve as the master. Large side ports provide plenty of light, and there is a dedicated head and a walk-in closet. Two more cabins, each with twin bunks that may be joined to form one, share the remaining head, which has a separate shower compartment. The headroom in these two staterooms is limited over the beds, so don’t expect your guests to do much more than sleep or lounge with a book in these spaces. Another unique feature is the galley placement. The trend today is to put the galley aft, so it can be central to serving both the aft cockpit behind, as well as the main saloon. On the Prestige 750, the galley also services the dedicated formal dining room. 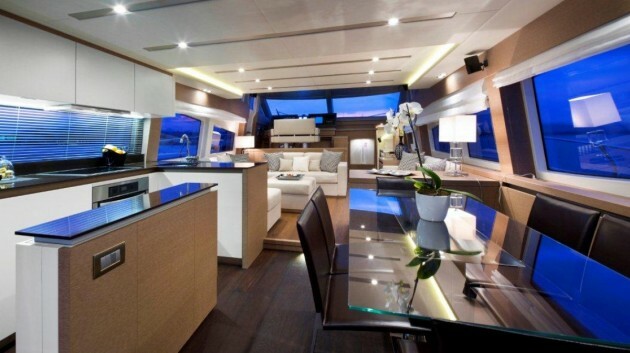 The glass table, to the side of the galley island, adds a nice aesthetic. Its transparency creates a sense of openness. The galley aft arrangement facilitates serving both the aft cockpit, and the main saloon, which has a dedicated dining area. A similar focus on super yacht features went into the creation of the outside spaces. Side decks are equally wide on either side and adequate for a quick transit to the bow. The bow features seats for six people and an accompanying sun pad for four more. The seating section lifts up to reveal a windlass and two cavernous lockers with shelves. The deck here has an integrated teak grate that provides sure footing and covers the anchor chain running to the bow roller. It’s a clean visual detail and safety feature all in one. At the other end of the boat there's a hydraulic swim platform that lowers smoothly into the water and creates the quintessential teak beach. It’s convenient for landing water toys, such as personal watercraft or inflatable tenders, or also for just lounging near, or in, the water. From this platform is access to the engine room, through a watertight door. Upon entering, there is a washer and dryer to port and a crew cabin to starboard with two bunks, a head, and a sink. Another door leads to the engine room itself with twin 1,000- or 1,200-horsepower MAN diesels and two stacked gensets. Headroom is good and engine access is adequate from three sides. 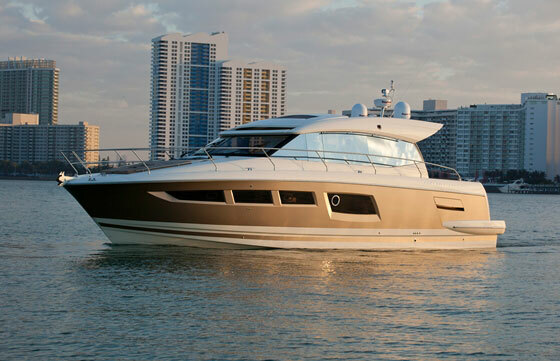 The flybridge on the Prestige 750 provides plenty of entertaining and relaxation areas for a large group of guests. 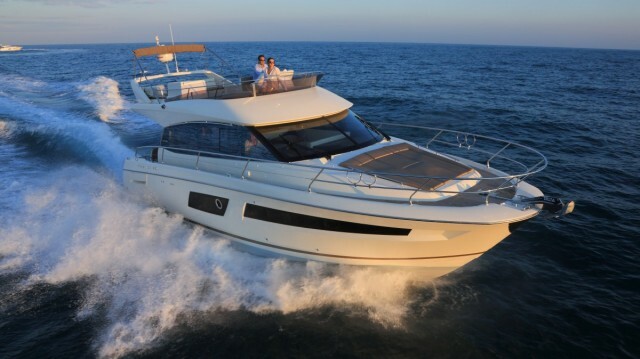 Up top, the flybridge is spacious. There is a full-featured helm with two multifunction displays, two engine screens, four instrument pods, and seating for two. Across from the helm seat is a companion seat for two, with a backrest divider that can be removed so the entire area becomes a lounge or a sun pad. 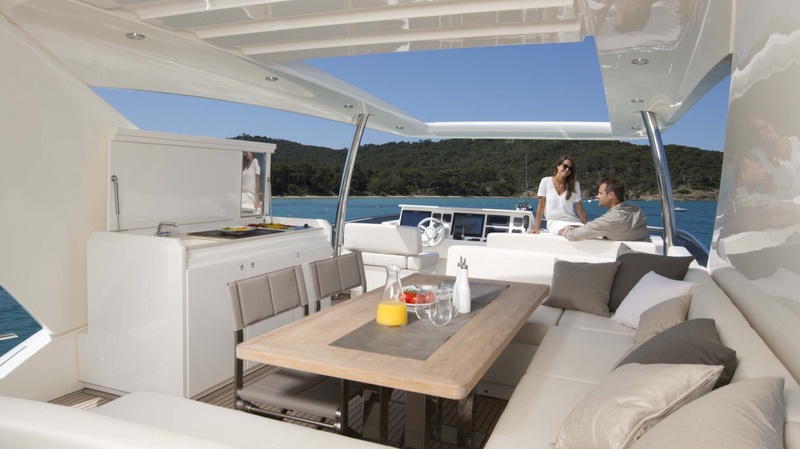 A sizable U-shaped dinette is to starboard and a full galley module with a grill, icemaker, fridge, and sink is to port. Once the tender is hoisted off the aft overhang, there’s room for chaise lounges or an open play space. 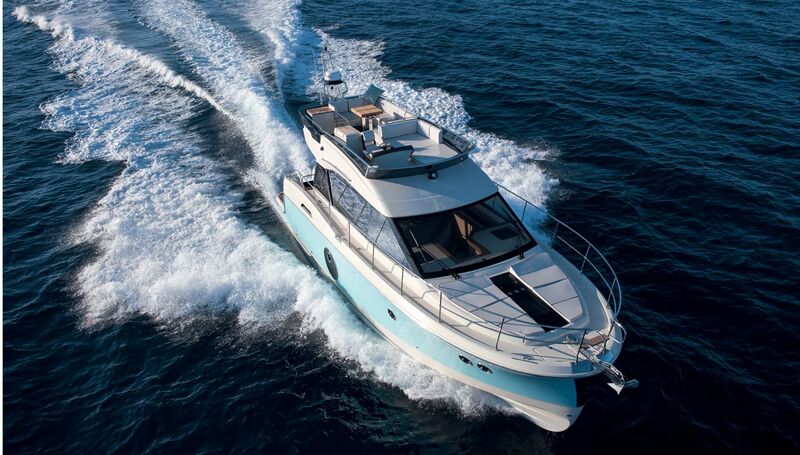 There’s simply nothing small about this flybridge, which can host up to 20 for cocktails. Aside from the common-rail electronic diesels, there are a few additional reasons why the Prestige 750 has a tilt toward fuel-efficiency. The overall design is relatively light, due to the vacuum-bagged construction. She is also narrower (17’ 10”) and has less draft (5’ 2”) than other vessels in her class, so she pushes less water aside underway, and that translates to fuel savings. The tradeoffs to this design are narrower side decks and a bit less stability overall. 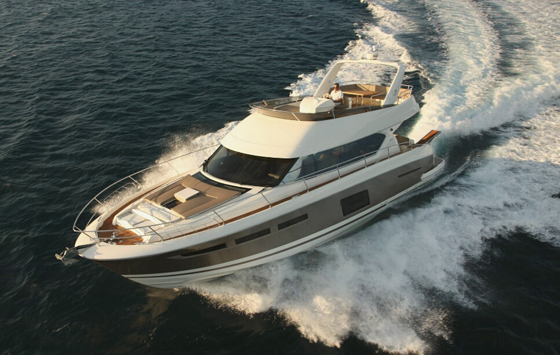 Other Choices: The Princess S72 is another capable, sleek flybridge motor yacht in this size range. 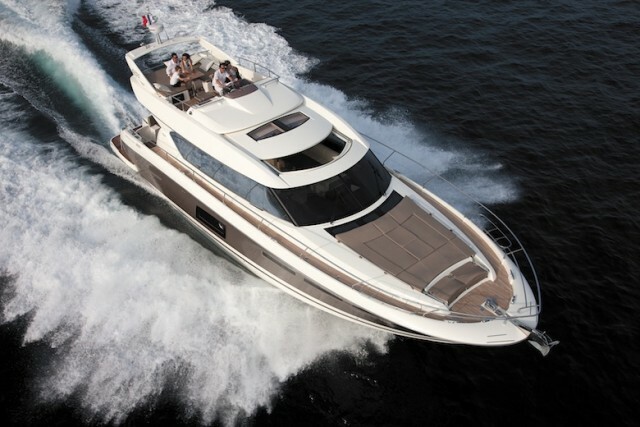 For a slightly smaller profile, but with lots of speed baked in, consider the Sunseeker Predator 68. 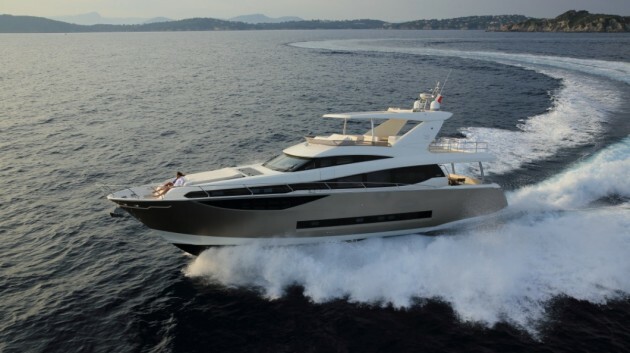 Fore more information, visit Prestige Yachts.